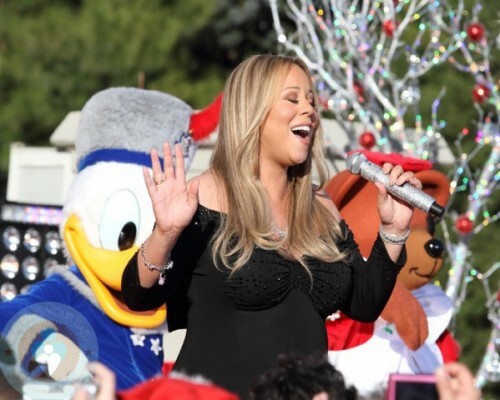 Mariah Carey looked gorgeous yesterday while taping a performance of her hit song “All I Want For Christmas Is You”, in front of the castle at Walt Disney World. The performance, along with 2 others by the five-time Grammy winner, will air on Christmas Day as part of Disney’s annual parade. Mariah started the song by singing while sitting in a horse-drawn carriage, and then moved on stage where she was accompanied by back-up singers and many Disney characters. She waved to the crowd, sang to Mickey and Minnie, and displayed her growing ‘baby bump’ in a tight-fitting black gown. Also look for country music artist Darius Rucker, singer/actress Amber Riley, Disney Channel stars Selena Gomez and Debby Ryan, young soprano sensation Jackie Evancho, “American Idol” Lee DeWyze, swing band Big Bad Voodoo Daddy, professional dancers from ABC-TV’s “Dancing with the Stars” and R&B sensation Sean Kingston to join the mom-to-be during the extravaganza! Mariah announced she is expecting in October. The new baby will be the first for the singer and her husband Nick Cannon. Alanis Morissette Is All Smiles in LA!